ProTrakker's implement steering hydraulic hitches are designed for use in a wide variety of precision agriculture applications. Various models are available for compatibility with nearly all modern tractors and equipment. Whether you practice traditional, contour, specialty crop, strip-till, or organic farming, implement guidance can have a major, positive impact on your bottom line. Read below to see how precision farming impacts every type of agriculture operation. As producers look for ways to optimize profitability through tillage options, strip-till has been the go-to solution for many. The benefits of strip-till include aeration, or fluffs, that allow wet, poorly draining soils to dry faster in the spring. Quicker spring dry-out and residue removal of the planting area also helps increase soil temperatures earlier than no-till options. ProTrakker’s hydraulic hitches allow you to have a precision strip-till operation that will bring benefits to your field. Reduce waste and optimize yields by avoiding overlaps and skips in your no-till operation with the accurate repeatability of ProTrakker. The precision offered by ProTrakker also reduces variability in guess rows and limits crop damage during cultivation. With the sub-inch accuracy of a ProTrakker Implement Guidance System, you can ensure consistent seed placement and coverage to maximize your return on investment. ProTrakker’s repeatability keeps you in the same tire tracks year after year, improving the soil structure and nutrient use efficiency of your plants. Increase the accuracy of your sidedresser, delivering fertilizer exactly where your growing plants need it most, with ProTrakker’s precision field application. Accurate fertilizer application maintains maximum yields while reducing the number of dollars going directly into the ground. Coming back into an existing row crop is damaging, but you can virtually eliminate any damage from incorrect implement tracking, making sidedressing with ProTrakker more efficient, cost effective and environmentally friendly. Accuracy and repeatability are crucial during cultivation to maximize effectiveness and minimize crop damage. Following the same lines year after year, cultivating with a ProTrakker Implement Guidance System reduces variability while preparing your field for a successful yield. 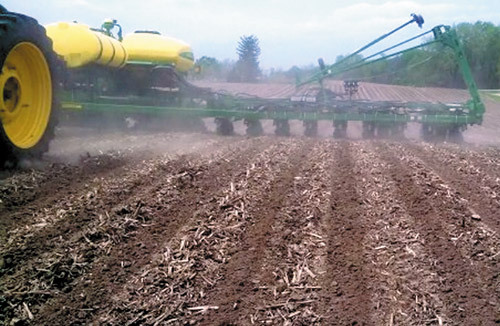 Improve planting accuracy with a ProTrakker Guidance System. You can improve field conditions and maximize your yield with the precise guidance of our hydraulic hitches, which are tailored to your implement’s specifications. Avoid damaging crops and wasting fertilizer when heading back into the field to spray. ProTrakker automatically adjusts for implement drift, keeping the implement from running over your emerged crop. And, with the repeatable sub-inch accuracy of ProTrakker, you can minimize overlap and skips for consistent and efficient application. Achieve the highest level of accuracy on specialty crops such as potatoes and beets, when repeatability is a must. ProTrakker Guidance Systems make specialty crop farming more accurate, ensuring the same pathway is taken with each pass. Driving curved paths when farming around terraces requires repeatable tracking to avoid unnecessary crop damage that affects your bottom line. Use a ProTrakker Implement Guidance System to ensure a high precision operation and reduce operator fatigue from constant tracking.